Dermatologists commonly use 10X Magnifiers with light source to detect melanoma, in addition to increasingly using the tool to assess other skin conditions and analyzing pores. 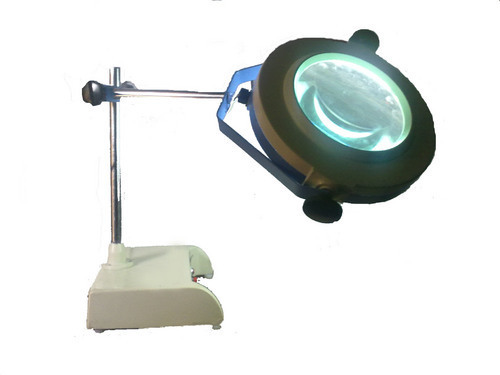 These units have a fixed head with one or more lenses to magnify the skin, with a light source inside the head or around the edge. Dermatologists often use an alcohol or oil solution between the magnifying lens and skin to reduce light scatter and glare, while improving visibility and clarity. She can then see through the stratum corneum, which is the bottom of the outermost layer of skin, for a detailed view of structures within skin that are often invisible to the naked eye. When using dermatoscopy software in conjunction with 10X Magnifiers, dermatologists can map out pore diameter for patients and recommend a course of treatment. For example, if the dermatologist determines pore size is large, he can prescribe a treatment regimen to counteract the excess sebum and inflammatory acne that can occur in patients with large pores. We "Dhanwantari Medical Systems", established in the year 2006, Backed with a rich industry experience of over a decade, our organization has established itself as a well known name leader in industry as manufacturer, importer, exporter, supplier, distributor, wholesaler and service provider Biomedical & Hospital Equipment. The products we have on offer consists of Portable X-Ray Machine, Mobile X-Ray Machine and X-Ray Units (Line Frequency). We also provide repair and maintenance work for medical equipment offered by us. The equipment we manufacture are strictly as per the medical industry guidelines. Use of advanced technologies and latest developments in the field of medical science is evident in these products. These instruments and equipment have high end features, which helps in effective diagnosing and treatment of ailments. Our client base constitutes major hospitals, nursing homes and health clinics. The products that we deliver to our clients are easy to operate and have high functional utility. Clients prefer our organization due to the quality of our products, our prompt after sales services and ethical business practices. We import our goods from China, Taiwan Korea, USA and Germany and we have a widespread export market All Over the World.